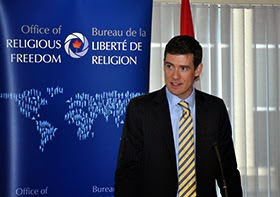 OTTAWA - Canada's religious freedom ambassador denounced Wednesday the persecution of Muslims in Myanmar and urged Canadian businesses eager to find opportunities in that resource-rich country to respect human rights. Ambassador Andrew Bennett said he also delivered his concerns about the well-document persecution of the Rohingya Muslim population directly to Myanmar government officials, including the country's foreign affairs minister. "Now really is the moment for a more inclusive process that brings all religious and ethnic communities together so that they can contribute to the country's development," Bennett, who was on a lengthy trip to the south Asian country, told The Canadian Press in an interview from Yangon. "There is prejudice that exists towards Muslims throughout the country. This is an ongoing challenge not only for Rohingya Muslims, but the situation facing them is particularly acute." Myanmar, formerly known as Burma, has faced widespread criticism for its persecution of Rohingya Muslims. Human Rights Watch has said that discriminatory policies have displaced 130,000 Rohingya Muslims, forcing them into closed camps. Canada has placed a priority on deepening economic engagement with Myanmar as it emerges from half a century of military-led, totalitarian rule, and opened an embassy in Yangon in 2014. A World Bank report last fall described Myanmar as having great economic potential, touting its "fertile lands, significant untapped agricultural potential and a rich endowment of natural resources." Bennett invited Canadian businesses to visit his office before they pursue corporate ventures in Myanmar. "Any Canadian businesses that are looking to engage in Burma, as with any country, they need to be aware of the human rights situation," said Bennett. Bennett's comments are significant on a couple of levels. They serve as a rebuttal to critics of the Harper government, who have contended that the office was geared towards protecting the rights of Christian minorities. They are also a counterpoint to the trade-heavy emphasis in Canada's foreign policy. Myanmar is a member of the 10-country Association of Southeast Asian Nations, or ASEAN, an organization on which the Harper government has placed particular emphasis. International Trade Minister Ed Fast led a trade mission to Myanmar and fellow ASEAN country, Laos, last summer and said the group of countries — which does not include China — represents an important market for Canadian businesses. Prime Minister Stephen Harper is expected to meet Philippines President Benigno Aquino III, leader of another ASEAN country, on Friday. During his Myanmar visit, Bennett announced a modest donation of $580,000 to help the country fight religious persecution. Bennett said the money will fund two projects that will try to improve religious freedom in order to advance Myanmar's security, stability and democracy. Bennett spent the last two weeks in Myanmar and also visited Indonesia, the world's most populous Muslim country and another ASEAN member. In Indonesia he met government officials, religious leaders and civil society groups to discuss religious freedom. "We really see Indonesia as a key partner for engagement in the region on religious freedom."